Haute Thoughts by Heidi Dillon: DON’T STOP DRESSING UP! While dismal economic news has chastened most of us and lavish spending has become unpopular in certain circles, let’s not let these dark times prevent us from enjoying what we have this holiday season and, please, let’s not let it stop us from looking our best when we go out. Even if you haven’t purchased any new cocktail pieces, I know that you all have them in your closet, so, by all means, wear them. Get dressed up. It’s OK.
My friends at Cartier were there showcasing some beautiful pieces from their newest jewelry collection, adding yet another layer of luxury to the evening. Sadly, only myself and maybe two other women were dressed for the occasion. The rest of the crowd looked as drab as a board meeting at IBM. After I downed a couple glasses of Ruinart champagne, the people at Park Place Rolls Royce unveiled the the new Phantom Coupe which is truly a beautiful piece of automotive artistry. Our next stop was at my favorite Dallas store, FortyFiveTen (that’s where I bought my great sequined pants). Owner Brian Bolke brought in Kelly Klein to sign her new gigantic picture book, Horses and jewelry designer Kimberly McDonald who makes incredible pieces from geodes and diamonds. While her things are a bit pricey, her work has an understated, bohemian look that I like – not at all the in-your-face bling that really does seem gauche right now. Being one of Dallas’ fashion gurus, Brian’s parties usually inspire people to put their best fashion foot forward, however that was not the case last evening. One friend of mine who I can usually count on to show up in the latest Lanvin cocktail number was sporting a Rick Owens jacket and a pair if jeans. While Rick is the coolest of the cool, my friend’s outfit would have been perfect for a chic lunch at the latest sushi place but really missed the mark for a holiday soiree. Looking around the room got me a little depressed. My friend wasn’t the only one to embrace the new dressing down trend. All of my gay boyfriends were coveting my outfit, but apparently I really stood out because an editor from Paper City asked me “you’re so dressed up. Where are you going tonight?” I replied “it’s Christmas in Dallas. We are supposed to be dressed up”. As for New Year’s Eve festivities tomorrow night, don’t hold back– go all out and dress up like it’s 1999! UPDATE: Shoe Goddess responds to Heidi’s post! As much as I sympathize with Heidi’s pain, I wonder if there was any preliminary sign to her foot situation and if she always wore well made shoes? I kind of see the article as a terrible blow to all the women (aged 50+) who gracefully wear high heels without the need of a trainer to teach them how to keep their balance in their high heels. Unless a shoe has perfect balance, I stay away from it. Pointy and very tight shoes are also a big no no. Being married to a fashion designer and a shoe maker, I can tell you that brands like Nicholas Kirkwood, Christian Louboutin, Marni, Roger Vivier, Brian Atwood, to name a few, don’t use a generic last. The lasts are handmade in their factories in Italy. It takes a long time to come up with the perfect last. There are a lot of steps in the process involving over 100 technicians and designers. First a piece of wood is sculpted and carved to become the last. 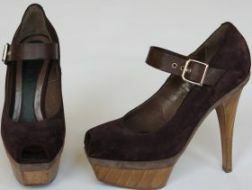 The heel is created in different materials, but it has to come together perfectly with the last. Then the upper, made of soft leather, fabric, or any material, is stretched to mold to the last. The lining is then stitched to the inside of the leather. The sole is sewed to the upper. Once these processes are completed, the shoe is transferred to a machine that simulates walking. The shoe is tested for at least a whole day before being approved. Besides buying quality shoes there are a few things you can do to help your feet. Massaging your feet daily with oil right after a shower can help by reducing inflammation (which also can be a form of arthritis). There are also a large selection of padded inserts readily available on the market that will provide a tremendous help. We really like Foot Petals. Regular pedicures and the use of a foot cream at bedtime are a must. My favorite is QTICA Overnight Intense Foot Repair Balm. Also don’t hesitate to take off your heels and slip into a cozy pair of slippers as soon as you get home. Your feet will thank you! I am not too worried about the future of high heels because even if bunions are a major issue that should be addressed seiously, women are not ready to give up the beauty and elegance of a fabulous pair of killer heels. As I grow older, my deepest fear is that I will lose my ability to wear high heels. If you take a look around, you will notice that most women over the age of, say, 50 have turned in their hot Nicholas Kirkwood skyscrapers for more “sensible” shoes. My mother, at 85, hasn’t been in a pair of heels for at least 30 years. I am now 55 and my fear runs so deep that I actually instruct my trainer to make me do exercised specifically designed to keep me balanced in my excruciatingly high heels. It’s all about the core and leg strength. Even though I train diligently 5 or 6 days a week, I still feel like I’m teetering on the edge of disaster every time I go out in a pair of my beloved Fendi’s or Lanvin’s. I only wear killer shoes, as a rule, in the evenings and I usually need two spotters to get me safely from my car to a bar stool where I can then swing my beautifully clad feet around in an amusing manner. The beginning of this downward spiral began three years ago when I had massive foot surgery. Because of my life-long love of fabulous footwear, I developed two bunions and eight hammer toes. (Heredity and years of slamming my feet on the aerobics floor may have hand a hand in this disaster as well). Post-op I was given the most hideous booties and a walker. Honestly, just having a walker made me feel like an old lady. I will never forget Tina coming to visit me, bearing a bottle of Cristal (though I was in excruciating pain for months, that and a couple of Extra Strength Tylenols were the only pain-killers I needed). I wanted to go out with my husband that evening, but just couldn’t see myself making an entrance with a walker. Tina and I tried to make it work by draping Hermes scarves on it, but it didn’t help. Exasperated, I gave the damn thing to my son who promptly dismantled it and made weapons. When Bill and I arrived at our favorite restaurant, I had to be carried in. It took six months for the swelling to go down enough just to get into a pair of sneakers and awful looking Taryn Roses’ that I purchases especially for the occasion. Every day I sat in my closet looking at all of my beautiful shoes and cried. A year post- op I was back in my highest heels. Now, most days, I wear my Nikes or flats and save the heels for evening. I pray the day never comes that I have to give them up all together. Haute Thoughts by Heidi Dillon- Winter Clothes in May?! I have fond recollections of the days, long ago, when summer was at an end a nip in the air would bring a rush of excitement and my shopping juices would start flowing. After three months of bathing suits and shorts, I couldn’t wait to wrap myself in fur trimmed coats and chunky sweaters. Life had order then. We purchased spring clothes in the spring, summer clothes in the summer and winter clothes in the winter. You could go into any store and know what time of year it was by looking at what was on the racks. Retailers are in the business of selling clothes and they are always looking for new ways to sell more, so they got creative and decided to change the fashion clock. As a result, we are always confused. Sometimes I fell like I’m suffering from a type of fashion jet lag. Spring clothes are shown on the runway in September and start to arrive in November. Fall shows are in February and the merchandise starts shipping in May. Technically, until December 21, it’s still fall and in most parts of the country it will be winter for a few more months but pre-spring and resort collections have already hit the sales floors. At least I get the resort thing, a lot of people take off this time of year for beach destinations and might need to pick up another caftan or whatever, but do we really need to look, at let alone purchase, a spring cocktail dress in December? What if I don’t want to go to any cocktail parties this spring? My family and I spend the summer in Malibu where we never get dressed up, never think of clothes, and enjoy the company of good friends. Every summer beginning in June, I start getting phone calls from my sales people at my favorite boutiques, Alexander McQueen, Prada, Balenciaga, etc., telling me that the most “amazing” fall pieces have just come in. I’ve caved in in the past and agreed to let them ship some things to me on approval in Malibu. When the stuff arrived my skin started to itch just looking at all those wools. Last summer I put my foot down and refused to buy fall clothes until it was actually fall. While I may very well have missed out on some “amazing” things, at least my fashion clock was properly set. This is a hot topic right now. On 12/11 there was a piece in WWD by Stephano Gabbana. He was complaining about the same thing I am. The department stores started that whole crazy schedule so that they could have a constant flow of new merch in the stores but the designers hate it because it forces them to have unreal production schedules and to design clothes that are sub-standard. They really want to stick to 2-3 seasons a year and ship clothes when it makes sense. I hate the department stores. They have had a strangle hold on designers and customers for too long. In Dallas they actually run the social scene. Enough is enough.